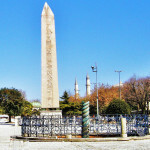 The Hippodrome, which today is also known as Sultanahmet Square, has been an important space in the city throughout its history. With many works from the Roman, Byzantine, and Ottoman periods, the original hippodrome was first built by the Emperor Septimus Severus in 203 C.E. 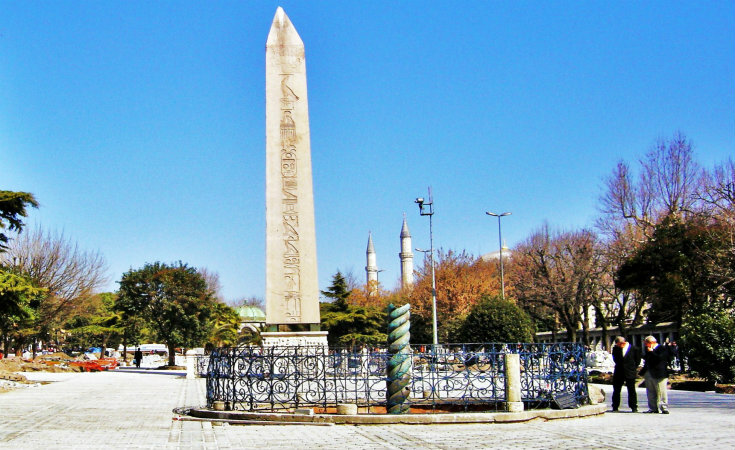 The Hippodrome (Hipodrom), today commonly known as Sultanahmet Square, has been an important spot in the city throughout its history with its various marks from the Roman, Byzantine, and the Ottoman periods. The original hippodrome was built by the Emperor Septimus Severus in 203 C.E. The most important monuments and structures of the few surviving from the Roman period are the ones built around the hippodrome. The Great Palace of Constantinople, for example, began next to the hippodrome and continued down to the sea. The surviving mosaics from this palace are now protected and exhibited in the Mosaic Museum. The area’s charm was largely a result of the Byzantine and Ottoman periods, when Istanbul’s most important monuments such as the Hagia Sophia, the Sultanahmet Mosque, the Yerebatan(Basilica)Cistern were built in the Hippodrome vicinity. The hippodrome, which means “path of the horses” in Greek, could hold up to 100,000 spectators according to some sources. As well as being the center of chariot racing, the hippodrome also functioned as a meeting spot and a place for entertainment and sports during the Roman and Byzantine periods. The hippodrome was built in the shape of a Giant “U” and on its longer, eastern side were the stables with their four bronze horses and the balcony that held the Emperor’s box. The sand field In the middle of the hippodrome was divided by a lower wall around which the horses raced and where many of the different imperial monuments and statues of famous horses could be found. Today the Egyptian Obelisk, the Serpent Column, the Walled Obelisk, and the Hippodrome’s southern edge are all that remain of the stone blocks and columns that once stood 4-5 meters above the ground. The majority of the materials were later removed and used in other projects. During the Ottoman Period the area took the name of the “Horse Square” (Turkish. At Meydanı) and, occasionally the site of festivals and performances, it was generally used for training horses. 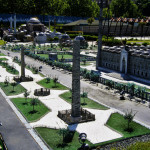 The Sultanahmet Mosque and the İbrahim Paşa Palace – today the location of the Turkish and Islamic Arts Museum – are important historical structures built during the Ottoman period. Its rich historical and cultural value make it one of the most vibrant parts of the city attracting attention from all over the world. Taksim: Take the funicular railway inside Metro for Kabataş. From Kabataş, take the T1 Zeytinburnu – Kabataş tramline for Sultanahmet. Atatürk Airport: Take the M1 Aksaray – Airport metro line and get off at Zeytinburnu station. Then get on the T1 Zeytinburnu – Kabataş tramline for Eminönü. Follow English instructions inside the train for the Sultanahmet stop. 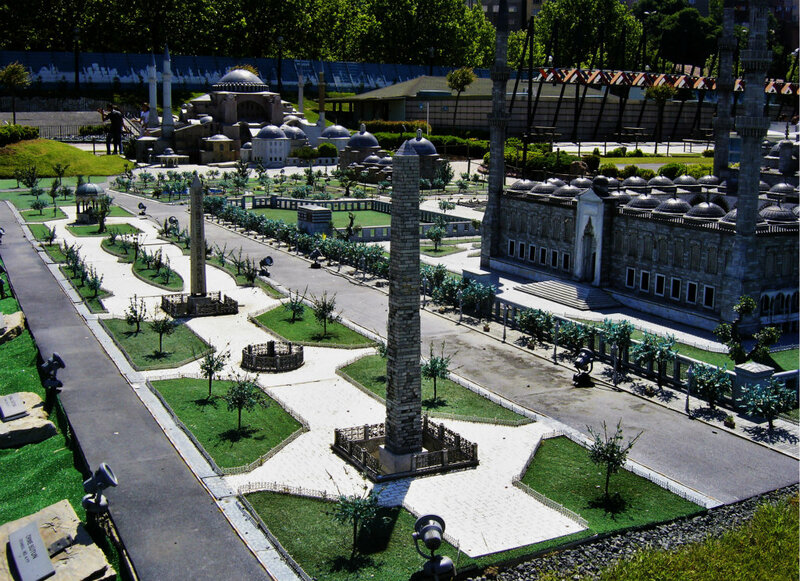 Blue Mosque Area: It is also called the Hippodrome.